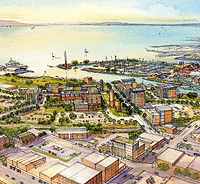 "Bellingham embarking on ambitious waterfront plan"
"Magnolia Bridge complicates pier project"
"Placid park belies a major engineering effort"
"21st-century waterfronts: What makes them work?" "Bellevue reconnecting with its waterfront"
"Planning a shoreline project? Win over the public first"
"Kennewick island lighthouse a beacon for downtown"
21st-century waterfronts: What makes them work? Northwest cities have figured out how to blend water-dependent industry with high-density development. Meydenbauer Bay park would improve public access and create a dramatic new urban plaza. $200 million public investment will cover parks, cleanup and infrastructure for 220-acre mixed-use district. Full build-out could cost $3 billion by 2040. 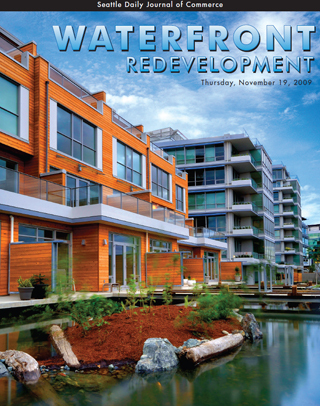 Synergy at Dockside Green, a 93-unit condominium complex in Victoria, B.C., is part of what will become a 1.3 million-square-foot waterfront redevelopment. 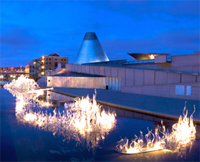 The project, designed by Busby Perkins + Will, was named one of the top 10 greenest projects for 2009 by the American Institute of Architects Committee on the Environment.